Albert Schweitzer (1875-1965) was a brilliant philosopher, physician, musician, clergyman and theological scholar. As recognition for his many years of humanitarian work he was awarded the Nobel Peace Price in 1952 and in 1955, Queen Elizabeth II conferred on him Great Britain’s highest civilian award, the Order of Merit. Schweitzer advocated religious tolerance and has been called one of the greatest Christians of his time. He based his philosophy on what he called “reverence for life”, an ethical principle involving all living things, which he believed essential to the survival of civilisation. He considered his greatest contribution his work The Philosophy of Civilisation which he wrote in 1923. Albert Schweitzer was born in Kaysersberg in Alsace on 14 January 1875. He grew up in nearby Gunsbach where his father was a Lutheran pastor. The medieval parish church of Gunsbach was shared by the Protestant and Catholic congregations, which held their prayers in different areas at different times on Sundays. This exceptional environment of religious tolerance produced in Schweitzer the belief that true Christianity should always work towards a unity of faith and purpose. Schweitzer studied Philosophy and Theology at Strasbourg University, completing his licentiate in theology in 1900. In 1899 Schweitzer became a deacon at the church Saint-Nicolas of Strasbourg and in 1900 he was ordained as curate of that church. The following year he became provisional Principal of the Theological College of Saint Thomas (from which he had just graduated), and in 1903 his appointment was made permanent. During these years he also became an accomplished musician, beginning his career as an organist in Strasbourg in 1893. In 1905 he wrote JS Bach: le musicien-poête, a study of the musician’s life and art. He became an authority on organ building and highly regarded as an interpreter and authority on the works of JS Bach and his life. Since the mid-1890s Schweitzer had formed the inner resolve to repay something to the world for the privileges which life had given to him and he determined that he would pursue science, music and preaching until the age of thirty and then devote himself to serving humanity, with Jesus serving as his example. He was inspired to become a medical missionary and to that end returned to university between 1903 and 1913 to study medicine. In 1913, with his wife, Hélène Bresslau, who had trained as a nurse in order to assist him, he set out for Lambaréné in the Gabon province of French Equatorial Africa. In the first nine months Schweitzer and his wife treated 2,000 patients, some travelling many days and hundreds of kilometres to reach them. Schweitzer’s wife was the anaesthetist for surgical operations. After briefly occupying a shed formerly used as a chicken coop, in autumn 1913 they built their first hospital from corrugated iron, with two 13-foot rooms (consulting room and operating theatre) and with a dispensary and sterilising room in spaces below the broad eaves. The waiting room and dormitory (42 by 20 feet), were built like native huts, of unhewn logs, along a 30-yard path leading from the hospital to the landing-place. The Schweitzers had their own bungalow, and employed as their assistant Joseph, a French-speaking Galoa who first came as a patient. Over many years, with money donated by his parishioners and raised by giving concerts for the Paris Bach Society, which he had helped found, he built a proper hospital which he equipped and maintained from his income, later supplemented by gifts from individuals and foundations in many countries. During World War I Schweitzer and his wife, German citizens, were interred as aliens and sent back to France. In July 1918, after being transferred to his home in Alsace, he was a free man again. At this time Schweitzer, born a German citizen, had his parents’ former (pre-1871) French citizenship reinstated and became a French citizen. By 1920, he was giving organ recitals and doing other fund-raising work to repay borrowings and raise funds to return to Gabon. In 1922 he delivered the Dale Memorial Lectures at Oxford University. Then, working as a medical assistant and assistant-pastor in Strasbourg, he completed the first two volumes of his monumental work The Philosophy of Civilisation. which had occupied his mind since 1900. Volumes I and II of this great work were titled The Decay and Restoration of Civilisation and Civilisation and Ethics. The two remaining volumes, on The World-View of Reverence for Life and a fourth on the Civilised State, were never completed. Schweitzer returned to Gabon in 1924. After the birth of their daughter, Mme Helene Schweitzer was no longer able to live there owing to her health. Schweitzer remained in Gabon until 1927, by which time he had restored the hospital to full function and had employed medical staff to continue his work in his absence. He returned between 1929 and 1932 and in 1935 and 1937. From 1939–48 he stayed in Gabon, unable to go back to Europe because of the war. Three years after the end of World War II, he returned for the first time to Europe and travelled back and forth (and once to the USA) as long as he was able. During his return visits to his home village of Gunsbach, Schweitzer continued to make use of the family house, which after his death became an Archive and Museum to his life and work. Schweitzer died in his beloved Gabon in 1965. His other works include The Quest of the Historical Jesus (1906), Out of my Life and Thought (1931) and From my African Notebook (1939). 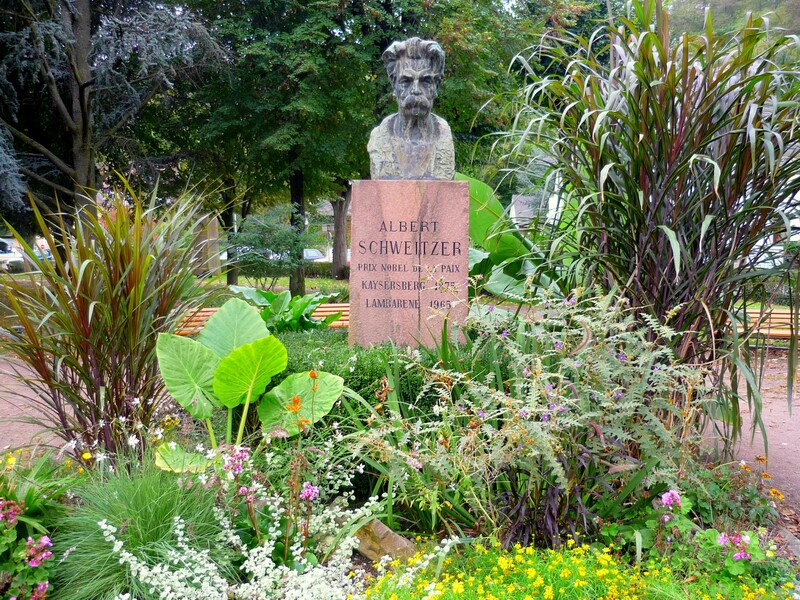 Today there are several museums dedicated to Albert Schweitzer, including in the town of Kaysersberg. Located next to the house where he was born, this museum exhibits documents, photographs, personal objects and souvenirs which retrace his life.